Did your Discovery Kids Boombox stop working? Consumers who purchased the Discovery Kids MP3 Boombox have complained that the battery compartment is defective and once you need to replace the batteries the backing of the battery compartment either brakes or won’t hold the batteries well enough to make the boombox work. 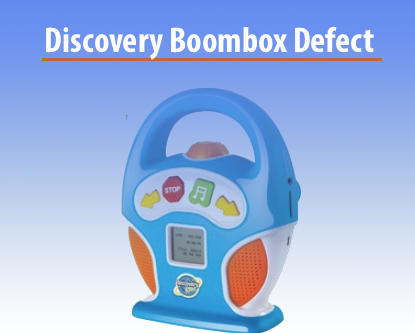 If you’ve experienced problems with the Discovery Kids MP3 Boombox, please report your complaint above. Did you purchase the Discovery Kids MP3 Boombox? If you have had negative experiences with this mp3 boombox, please fill out the short form above to report your issue. We can work to help you potentially receive money to offset your negative experience with this boombox and protect other consumers from this same poor experience. In order to protect your rights, you can contact me in the form above. Contact me now to see how I can help you possibly recover money. Contacting me is risk-free since I am only paid a percentage of whatever I can help you recover.